Most of the time when we think of being prepared for an emergency, whether its living without our usual comforts or we need to evacuate our homes, we often think first of food and water. These are obviously two of the immediate needs and rightfully so since we can only survive several days without water and a few weeks without food. What about the times when the emergency or evacuation lasts longer? 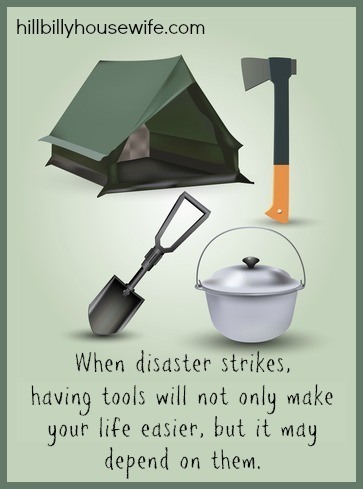 In those instances, other survival items and skills come into play which are just as important. Shelter is one of the basic needs and therefore should be at the top of your list for non-food items. You never know what type of disaster might happen so knowing exactly what you’ll need for shelter is difficult to say. Having the supplies to create a makeshift shelter is your best bet. You will want ropes, tarps, a hammer, nails, and a handsaw or hatchet at minimum to build a simple shelter. If your space and budget allows, you may want to purchase a couple pop-up tents. These are ideal in the case of evacuation because they are easy to put up quickly, portable and lightweight. Most of these tools can easily fit into a toolbox for storage. But, to cut down on having to worry about so many separate tools in an emergency situation you might want to invest in portable, lightweight multi-use tools, especially if you will need to evacuate and travel any distance. You have already packed water for your family, so why bother with a filtration system? There is a chance that the water will run out. You’ll want to set up a water filtration system of some sort to be sure you have a clean water supply available. This doesn’t have to be fancy or expensive, although having a water filtering system is definitely a plus. It minimum you’ll need a something to get water with and a large pot for boiling it. If there is a shortage you can gather water from the river, stream, lake or pond or even rainwater. All water, even water that is being filtered, should be boiled first if possible. Then you will need something clean to store the filtered water in. Just this one emergency supply kit could save a great deal of trouble. When a disaster strikes, we often long for the little comforts we didn’t realize were so important to us. Along with the necessities like shelter, food and water, there are items that help us function better because we feel better. We sometimes forget about these ‘luxuries’ because they have become so commonplace in our ordinary life. But, an emergency situation means nothing is ordinary. Having these products on hand can make a difficult time a little bit easier, or, at the very least, more comfortable. What is a seed bank? This is a supply of good seeds to grow a garden for food. You may not think that this is necessary because you have already packed your nonperishable food supply. But, a seed bank is important in the event of a long term catastrophe. Stockpiled food will be depleted and it is important to have a seeds you can grow to supply yourself and your family with the food you’ll need to survive. You will need to know your growing climate and the types of seeds that will thrive in your area. If you’re short on garden space, use containers to plant your vegetables wherever you have room. The better prepared you are the better the outcome will be when facing an emergency situation. Take inventory of what you have available and stock up on the rest to ensure you will be able to survive through whatever disaster may strike. Will You Be Prepared for an Emergency on the Road?